This topic describes how to create the stemcell that Pivotal Application Service for Windows (PASW) needs to create VMs on vSphere. Note: The instructions in this topic are based on vSphere 6.0 using vSphere Web Client. To create a Windows stemcell for vSphere, you create a base Windows VM from a volume-licensed ISO and subsequently maintain that base template with all Windows recommended security updates, but without the BOSH dependencies. Note: The stemcell you create in this topic is based on Windows Server, version 1803. The VM with security updates serves as the base for all future stemcells, produced from clones of that base VM. This enables you to build new stemcells without having to run Windows Updates from scratch each time. You can also use a “snapshot” feature to maintain an updated Windows image that does not contain the BOSH dependencies. Pivotal recommends installing any available critical updates, and then rebuilding the stemcell from a clone of the original VM. A Windows Server, version 1803 ISO, from Microsoft Developer Network (MSDN) or Volume Licensing Service Center (VLSC). You can use an evaluation copy for testing, but Pivotal does not recommend an evaluation copy for production, as the licensing expires. Note: Pivotal recommends maintaining a separate, updated Windows VM based on this ISO to serve as the basis for the installation steps below. This enables you to apply Windows Updates and create new stemcells without having to reinstall all updates from scratch. Open a VM in VM Remote Console on a local desktop. The ability to download/transfer files and software to a vCenter Windows VM. The latest release of stembuild. lgpo.exe from the Microsoft Security Toolkit. The BOSH PS Modules and BOSH Agent for the 1803 stemcell version you want to build. Note: You must choose a stemcell version to build. Stemcells are versioned as MAJOR.MINOR, such as 1803.2. For more information about 1803 stemcells, see the Stemcell v1803.x (Windows Server, version 1803) Release Notes. This section describes how to create, configure, and verify a base Windows VM from a volume-licensed ISO. Click Storage in the vCenter menu. Choose a datastore and click or create the directory where you want the Windows ISO. Click Upload a file to datastore, and upload the Windows ISO. Note: You might need to install the vSphere client web plugin to upload through your browser, or scp the file directly to the datastore server. For more information, see the VMware vSphere documentation. In the vSphere client, click the VMs and Templates view to display the inventory objects. Right-click an object and select New Virtual Machine > New Virtual Machine…. 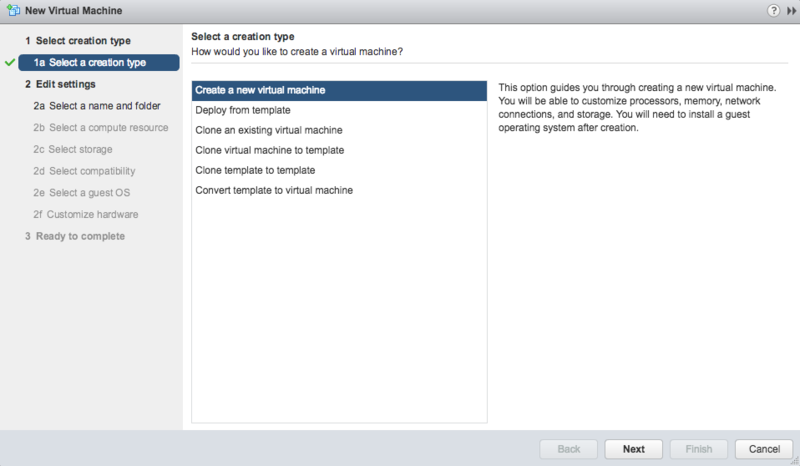 On the Select a creation type page, select Create a new virtual machine and click Next. Enter a name for the VM. Select a location for the VM. On the Select a compute resource page, select a compute resource to run the VM and click Next. Select a VM Storage Policy. Select the destination datastore for the VM configuration files and virtual disks. On the Select compatibility page, for the Compatible with configuration setting, select ESXi 6.0 and later and click Next. For Guest OS Family, select Windows. For Guest OS Version, select Microsoft Windows Server 2016. For New Hard disk, specify 30 GB or greater. Select the ISO file you uploaded to your datastore and click OK. Enable the Connect At Power On checkbox. Review the configuration settings on the Ready to complete page and click Finish. After creating the VM, click Power On in the Actions tab for your VM. Complete the installation process, and enter a password for the Administrator user. BOSH later randomizes this password. WARNING: You must complete the following procedure to verify your OS version before continuing. The output includes Version: 10.0.17134. 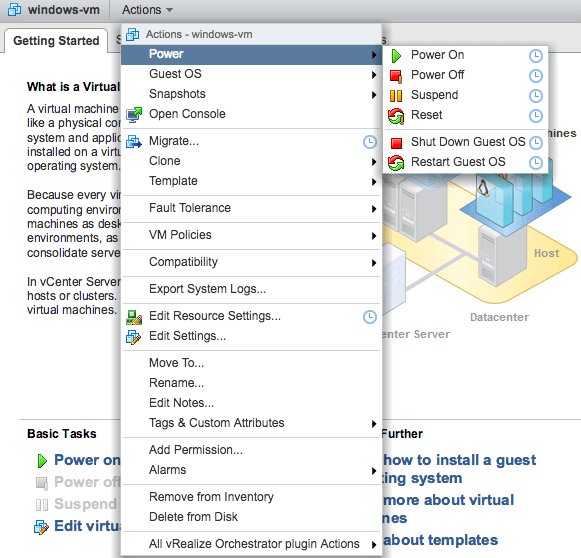 Under the VM Summary tab, select Install VMware Tools. Navigate to the D: drive and run setup64.exe. Note: The VMware Tools install window might appear behind the Command Prompt window. Restart the VM as required to finish the install. This section describes how to install Windows updates on your base Windows VM. Install Windows updates on the Windows VM using your preferred procedure. On the Windows VM, run the SConfig utility. Select option number 6, Download and Install Updates. Select A for (A)ll updates. For the Select an option, select (A)ll updates. You might need to restart the Windows VM while installing updates. WARNING: You must enable Meltdown mitigation. Not enabling Meltdown mitigation can lead to timeout issues while deploying the PASW tile. Windows Server, version 1803 should receive the update containing the Meltdown mitigation automatically when you install Windows updates. reg add "HKEY_LOCAL_MACHINE\SYSTEM\CurrentControlSet\Control\Session Manager\Memory Management"
Clone the VM that has the Windows updates installed. Save the original VM so that you can run updates on it in the future. In the vSphere client, right-click the current Windows VM. Select Clone > Clone to Virtual Machine…. Ensure that you can create the VM that can be used to create a stemcell for the next Patch Tuesday Monthly Updates. You might need to specify an explicit execution policy for all of the PowerShell commands in the Step 4: Install Required Software section. You specify an execution policy with the -ExecutionPolicy flag. powershell -ExecutionPolicy Bypass -Command "Install-CFFeatures"
Some of the procedures described in the sections below require transferring files to a Windows VM. Many different methods exist to transfer files to a Windows VM, such as folder sharing or the PowerShell Invoke-WebRequest cmdlet. Use whatever method that you prefer. Invoke-WebRequest -Uri "EXAMPLE-URL/filename.zip" -OutFile ".\filename.zip"
Locate the BOSH PS Modules download for the 1803 stemcell version you want to build, such as 1803.2. Transfer the bosh-psmodules.zip file to your Windows VM. Where PATH-TO-BOSH-PSMODULES.ZIP is the full path to the location of bosh-psmodules.zip on your Windows VM. Locate the BOSH Agent download for the 1803 stemcell version you want to build, such as 1803.2. Transfer the agent.zip file to your Windows VM. Where PATH-TO-AGENT.ZIP is the full path to the location of the agent.zip file on your Windows VM. You can use the bosh ssh command on BOSH-deployed Windows VMs if you install the OpenSSH dependency on the Windows VM and then enable it during deploy time. This lets an operator enter into a CMD or PowerShell session on the VM as a user with admin privileges. Transfer the OpenSSH-Win64.zip file to the Windows VM and place it in C:\provision. When configuring the PAS for Windows tile, you must select the BETA: Enable BOSH-native SSH support on all VMs checkbox. For more information, see Installing and Configuring PAS for Windows. Note: Windows Server stemcells can be large, and can exceed the 10GB upload limit imposed by default by the BOSH Director. This step “syspreps” the system, which ensures that each BOSH VM has a unique identity and applies the appropriate startup configuration at boot time. The included policies help ensure the uptime and secure operations of the stemcell’s VMs, especially when deployed on PCF. Note: This step disables services that could cause restarts, such as Windows Automatic Updates. OS restarts are not supported on BOSH-deployed Windows VMs, and the BOSH Director resurrects the VM by destroying and repaving it. Transfer the LGPO.ZIP file to the Windows VM. Note: All of the flags of Invoke-Sysprep except for -IaaS are optional. PASSWORD is an optional flag that enables you to set a password of your choice. Do not use any special character in the password other than !. For example, Example12! is permitted but Example#12 is not. This is a known issue. OWNER and ORGANIZATION are optional flags. Set them if your organization requires it. The sysrep command powers off the VM. WARNING: Do not turn the VM back on before completing the procedure in Step 6: Export the VMDK File. 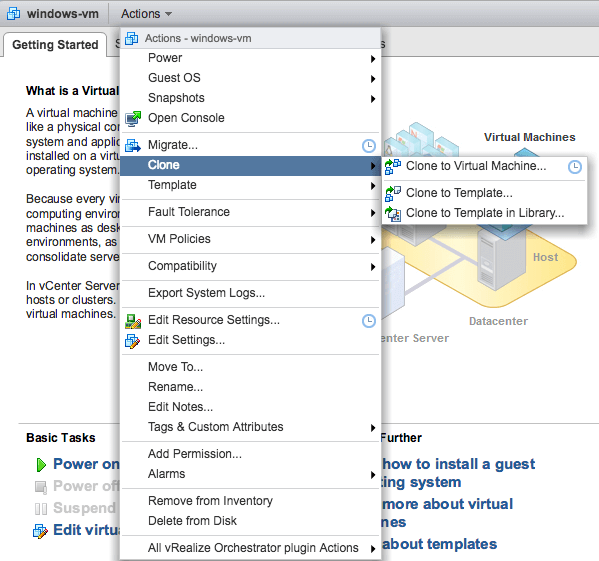 In vCenter, right-click the VM and select Template > Export to OVF Template. Download the OVA to your local machine. You do not need to include files in the floppy or CD Drive. Note: You can also download the standalone vSphere client and select File > Export > Export OVF Template. Rename the downloaded OVA file to have a .tar extension. Expand the TAR archive and locate the VMDK file. Note: This final step typically takes about ten to twenty minutes to complete. Download the latest release of the stembuild utility to your local machine and place the executable in your command-line path. Download ovftool to your local machine and place the executable in your command-line path. Note: On the Windows desktop, ovftool is installed by default in C:\Program Files\VMware\VMware OVF Tool. stembuild invokes ovftool to convert the disk image to the appropriate stemcell format and apply the proper configuration. PATH-TO-VMDK is the path to the VMDK file. STEMCELL-VERSION is the 1803 stemcell version you want to build. For example, if you downloaded the BOSH PS Modules and BOSH Agent for the 1803.2 release, then specify 1803.2. The stemcell is ready for use in conjunction with your BOSH deployment. On Patch Tuesday, run Windows Updates on the base image, and then repeat Step 3: Clone the VM through Step 7: Convert the VMDK File to a BOSH Stemcell. Please use the most recent stemcell. Install-CFFeatures might not have run successfully. Get-WindowsFeature "Containers" | Where InstallState -Eq "Installed"
Get-WindowsFeature "Windows-Defender-Features" | Where InstallState -Eq "Removed"